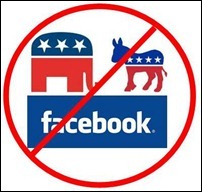 Are you sick of seeing all the political posts on Facebook? Social Fixer can help by hiding them all, or moving them to a separate tab where you can ignore them or read them later! 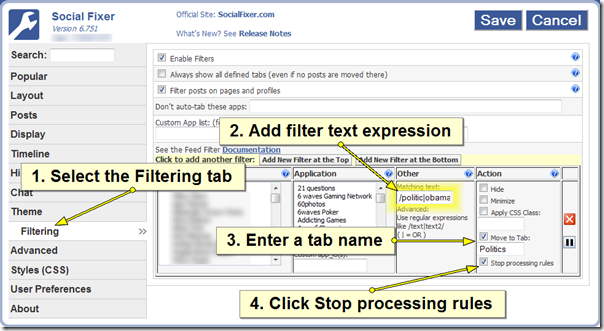 First, make sure you have the Social Fixer browser extension installed. Just go to http://SocialFixer.com and install the version for your browser. 1. Click on the Filtering tab to create a new filter. If you are an existing user and have filters already setup, you’ll need to click the “Add New Filter at the Top” button to create a new placeholder. 2. Enter a text string. This box uses regular expression syntax, so you can build powerful pattern-matching filters. But for now, you can use a simple example and modify it to fit your personal preferences. 3. Now click “Move to Tab” and enter a tab name, like “Politics”. All posts that match this filter will be moved to this new tab in your Facebook stream. If you want to just hide the posts altogether, you can click the “Hide” box instead. 4. Finally, click the “Stop processing rules” box. This simply tells Social Fixer that if you have more filters, but a post matches this one, ignore the rest of the filters. You’re done. Now click Save, and refresh your news stream. You should see something like this! But you might not see a Politics tab. This just means that no posts in your feed matched your filter, so the tab wasn’t created because it would be empty. When a post does match, the tab will be magically created. What Does That Filter Mean? The slashes are just the wrapper around the expression which means that it uses regular expression syntax. The | character means “or” in RE syntax. So all these words just tell the pattern matcher to look for “politic or obama or romney or …”. Partial words will match, so using “politic” will match “politics” or “political” or “politician”. The “i” at the end simply means case-insensitive. So capitalization won’t matter when the pattern tries to match. The filtering system in Social Fixer is powerful, though a little confusing (until I improve it). 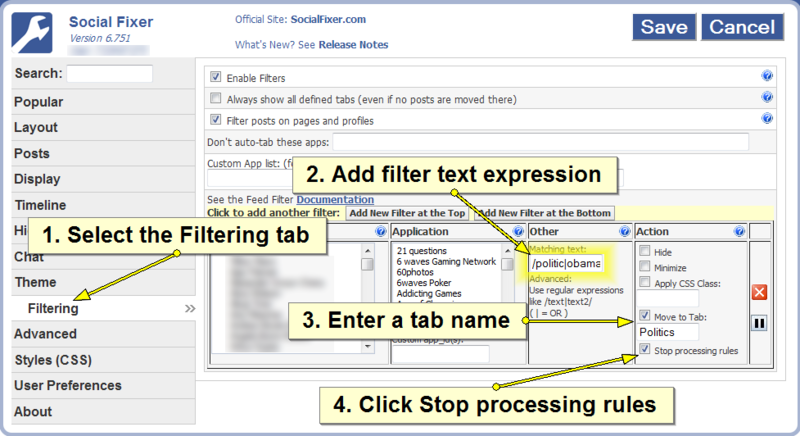 There is some (slightly outdated) Feed Filter Documentation available, and you can always ask for help on the Social Fixer Page on Facebook. Why yes, it is! Social Fixer gives you a lot of tools and options to customize your Facebook experience. By giving you more control, I hope you’ll ignore the junk you don’t want to see, focus on the things you want to see, and enjoy your social experience even more. If you like Social Fixer, or want your friends you know that you can filter out content like this, please share this post and/or Social Fixer with them. This is a one-man operation, and I have no marketing budget. The only way this spreads is by the posts of people who love what it does! Thanks!